Are you shopping for yourself or the man in your life? Either way, you may wish to check the Hugo collection at Bloomingdales. 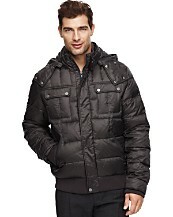 You will find many fantastic coats, dress shirts, sweaters and more for fall 2010. Possibly, the Brist Plaid Double breasted wool peacoat or the Hugo Basilius Zip Jacket would be right for you. Persoanally, I like the Hugo Blan zip up hooded jacket pictured below. Learn more about Hugo Boss from their website. By the way, you can discuss Hugo Boss fashion at the Hugo Boss fashion group on the Fashion Industry Network. Learn more the men's Hugo Boss brand and other popular fashion brands.